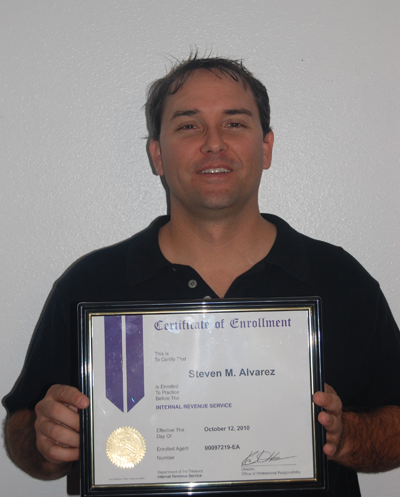 Steven Alvarez, an accountant with the Apollo Beach accounting and bookkeeping firm, Alvarez Company PA CPA Firm, was recently approved status as an enrolled agent from the Internal Revenue Service. 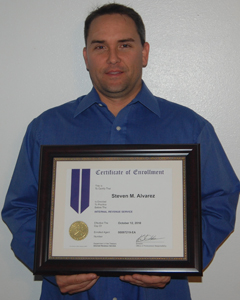 As an Enrolled Agent, Steven Alvarez is a federally authorized tax practitioner who has technical expertise in the field of taxation and is empowered by the U.S. Department of the Treasury to represent taxpayers before all administrative levels of the Internal Revenue Service for audits, collections, and appeals. In order to receive Enrolled Agent status, Steven had to pass a comprehensive examination which tested his knowledge on all aspects of the tax code. All candidates are subjected to a rigorous background check conducted by the IRS. Audited by the IRS? As an Enrolled Agent, Steven can represent you. As an enrolled agent serving Apollo Beach and the Tampa Bay community, Steven can advise, represent, and prepare tax returns for individuals, partnerships, corporations, estates, trusts, and any entities in which IRS Tax reporting is required. His knowledge with the continually changing tax laws give him the ability to represent those being audited by the Internal Revenue Service. What’s the Difference between a CPA and an Enrolled Agent? * Taken from the NAEA (National Association of Enrolled Agents). According to the NAEA, there are only about 46,000 enrolled agents in the United States. Alvarez Company PA CPA Firm provides professional accounting and bookkeeping services for individuals and small business owners within Hillsborough County. The firm has clients in Apollo Beach, Tampa, Brandon, Riverview, Ruskin, Sun City Center, as well as Pinellas County, Pasco County and Polk County.